Immediately after the sprain Arnica should be given every 15 minutes. The first step as soon as a sprain takes place is cold water application. Keep the sprained part under a cold tap water for 2 – 3 minutes. Carefully twist and move the foot in every direction and so give displacements, a chance to slip back in to place. In a half cup of hot water mix one teaspoonful of Arnica Q. (mother tincture) and apply a compress of cloth moistened with this solution on affected part. Moisten the compress of cloth every 5-10 minutes at least for one hour. When the pain has ceased and the swelling subsided, external application be discarded and only Arnica internally repeated at long intervals. R.T. will be called for if Arnica fails or only partially improves. R.T. should be given three times a day. If pains and swelling persist even after Arnica and R.T., Bryonia should be given three times a day or Bryo. and R.T. should be given in alternation every 3-4 hours, until the patient feels relieved from the stiffness and soreness in the limb. Even after a week if the pain and swelling still persist, Ruta should be given three times a day. 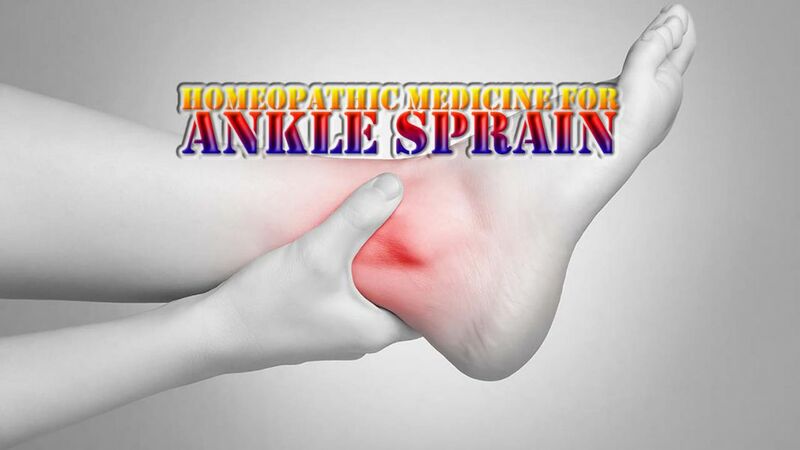 An important remedy for easy spraining of ankle. Pain in ankle worse motion, warmth.